Actually I was quite satisfied with my TS 90/600 triplet apochromat. The triplet came along with a fibre reinforced carbon tube and a Baader Steeltrack focuser. At the time I purchased the scope my only intension was to use it visual. Years later I still think that the scope was excellent for this application. 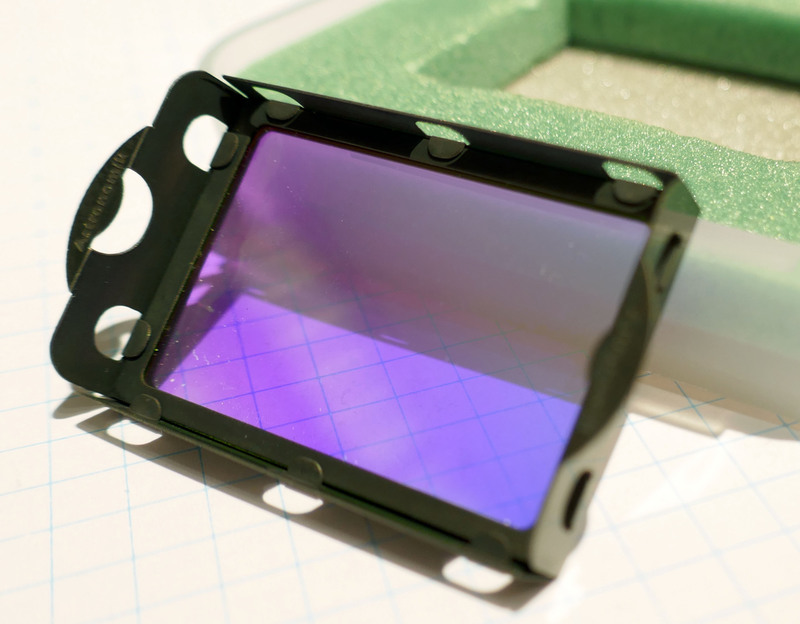 It comes with a smooth working focuser and delivers needle-sharp stars without noticeable chromatic aberration. All this weighs 3.5 kg only. Here I will give a description of the Skywatcher Esprit 100 ED, my way of setting work and the history how I came to it. It took much effort to optimize the flattener to chip distance. Finally I figured out that 119 mm is the best back focus. Since the original flattener casing was a bit too loose I started my lathe and built a new one. The latter fitted inside the Steeltrack tube tight but without any tense. 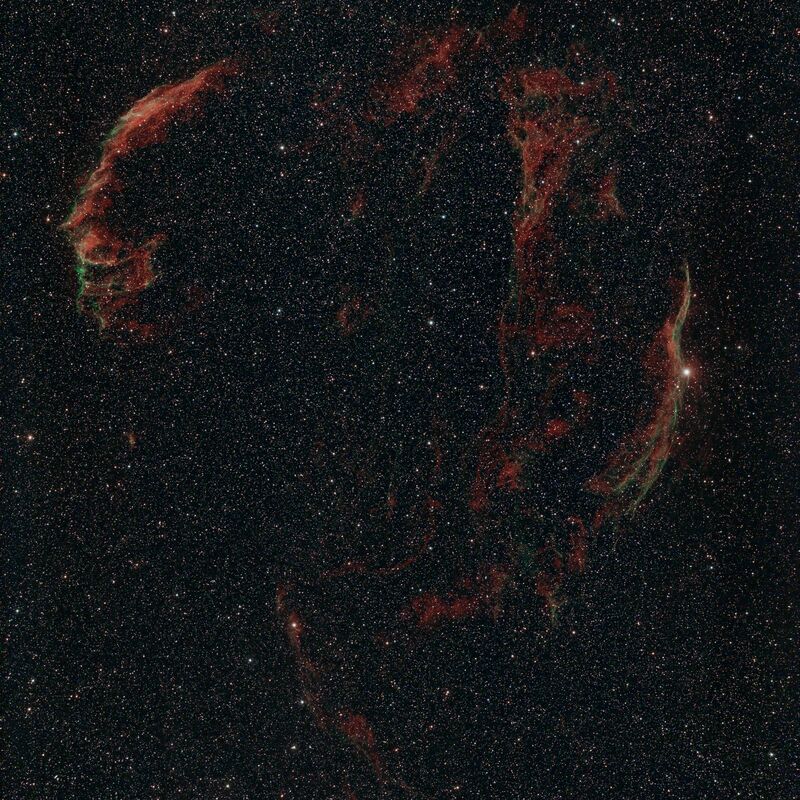 With the TS 2″ flattener in its new casing the image train gave excellent star-images. 90 mm TS-Optics Triplet on the Avalon Linear. More or less some disadvantages of this scope for photographic use led to the desire for something which fits better to my requirements. What are the photographic disadvantages? The focal ratio is f/6.7 this is fast enough for many famous objects, but too slow for fainter objects or even narrowband imaging. The Steeltrack is 2″ in diameter and it has no thread. It is designed for clamping equipment at the eyepiece side, only. In my opinion threaded connection of photographic equipment is to prefer. The diameter of 2 inches is large enough for APS-C size chips but too small for full format. Although the lens shall be full format capable the focuser vignettes too much in that case. Hence the system is limited to APS-C, smaller or similar sizes. Because of the focuser the scope is only suited for some certain reducers. I tried the TS 0.79x reducer and the Tele Vue TRF-2008 which both are clamped 2 inch ones. The TS reducer gave good results and increased speed up to f/5.3. The price to pay for that was slightly larger star-images, I would say. The successor should be a high quality refractor again or even better. The most important requirement is a fast focal ratio. Searching for suited scopes it reveals very fast that only a few types are in the closer choice. Most of them are really high priced. 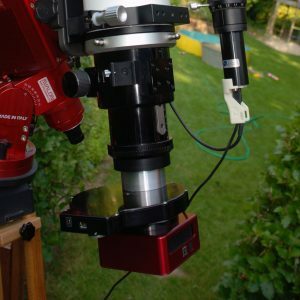 Someday an amateur known from astronomie.de offered his Skywatcher Esprit 100 ED in a package with the original flattener and the small Riccardi reducer. I got the final impulse by the interesting thread at Cloudy Nights, which encouraged me in my opinion that the green Japanese scopes are not the only alternative. Now the above mentioned telescope is mine and I don’t regret this step. It offers f/5.5 with the original flattener (threaded) and f/4.1 with the Riccardi (also threaded). After the first 9 months I have the feeling that the picture quality with the Riccardi is even better than with the original reducer. So I run this scope almost always with f/4.1 thus it gives a wide view angle with my KAF-8300. 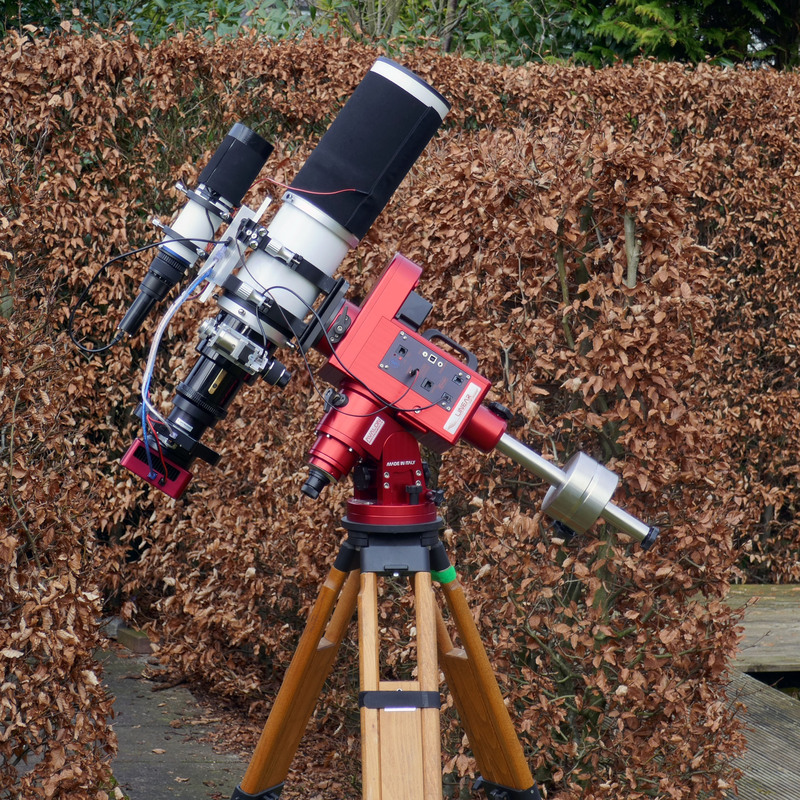 The Skywatcher Esprit 100 ED on the Avalon Linear with Atik camera and Riccardi reducer. Coming from f/6.7 down to f/4.1 reduces the required exposure time down to 37% for non-stellar objects. In practice this difference gives a dramatic effect, because I keep the times more or less in the old range (10 min for RGB and 20-30 min for narrowband). Together with dew shield, tube rings and mounting plate the scope has about 8 kg mass, which is not really lightweight – don’t forget the CCD camera, flattener or reducer, the filter wheel and the guiding scope with camera, also. It can be used visual as well as photographic. In the latter case I have the original M48 Field Flattener or the M63 Riccardi available, see below. Reviewers of the first exemplars complained about the focuser. I can’t confirm that. 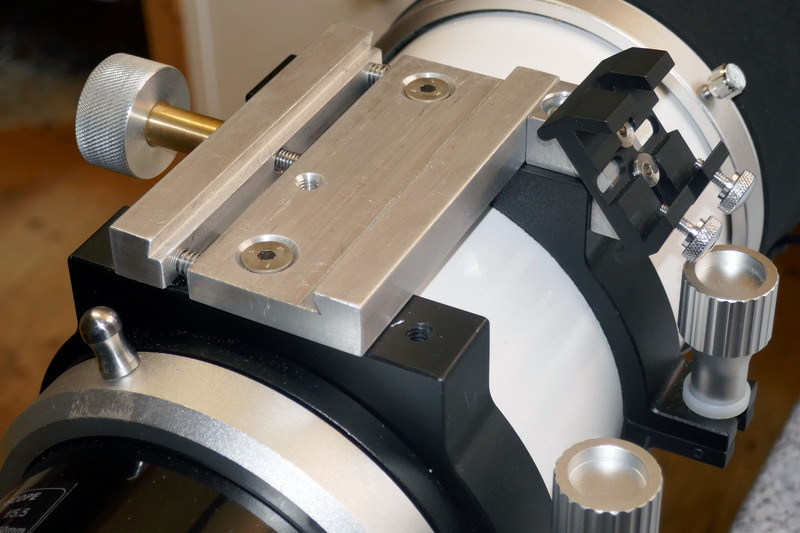 The scope comes with a rotatable 3” CNC-machined 11:1 dual-speed Linear Power Focuser. I didn’t noticed focus-shifting during focusing. The load capacity seems to be by far enough for my Atik 383 with filter wheel. The smooth focus motion and 11:1 fine focus wheel allows precise adjustment. First approach to attach a focus motor directly to the shaft of the planetary gear. One of the first actions was to adapt a motor focus. 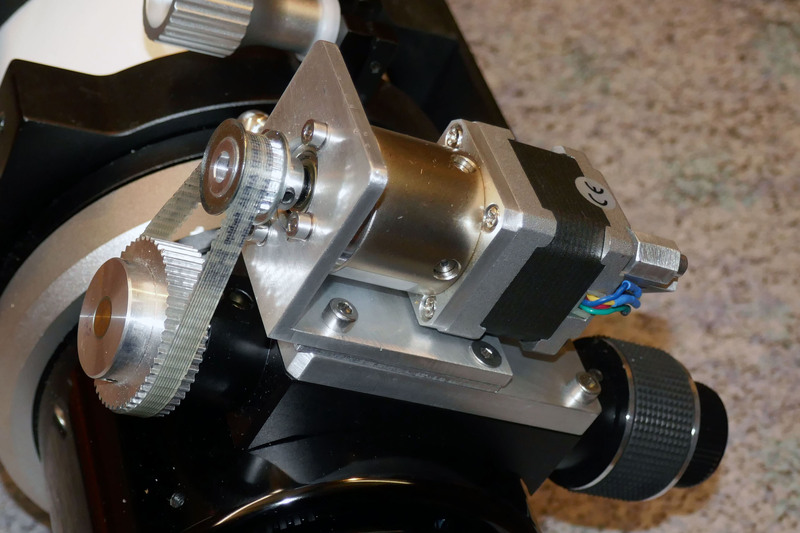 My first approach was to drive the fine focus shaft with a stepper motor. With that approach my system showed slip in the 1:11 planetary gear. This usually happened if the focuser had to lift the camera weight vertical. This prevented a reproduction of focus positions. The slip was only e few steps, but after moving 10 times in and out one sometimes I had a summed error of about 1/10 mm. A no go for automatic focusing! Consequently I run a second approach without driving the planetary gear. Needless to say, this behaviour does not play any role during manual focusing or visual use. Adaption of a geared stepper motor to the Skywatcher Esprit focuser. 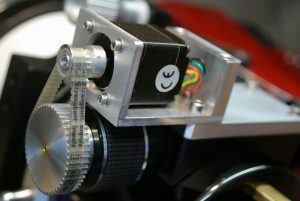 Now the final set-up utilizes a geared stepper motor and drives the focuser’s main shaft directly by a NEMA 14 motor with a gear ratio of 1:19. Transmission to the focuser shaft is done via a toothed belt drive with a gear ratio of 1:4. In total this gives a ratio of 1:72 which is by far fine enough for a precise focusing. For green light at a focal length of 415 mm the critical focus zone for my Atik with 5.4 µm pixels is about 40 µm. On the other hand the NEMA 14 motor has 200 steps per revolution which results in a step width of about 1.75 µm per step (measured 571 steps per mm). I purchased the motor earlier at Stepper Online for my GP motorization, but replaced it later by another type. The datasheet of this geared stepper can be loaded down here. Matching the proper distance of the focal plane to flattener or reducer is of great importance for best photographic results. Usually for a given flattener or reducer it depends on the telescope. So the task is to find the optimum back focus distance for the Skywatcher Esprit with the original flattener as well as with the Riccardi. The back focus distance for the original flattener given by Skywatcher is 63 mm from the M66x1 thread. During my tests I could verify this value. In the range of accuracy I reached the tested filters did not show any reproducible influence on the distance, consequently I’ve chosen 63 mm as the nominal value for following set-ups. The Esprit is quite good corrected for full format chips. For this reason the adaption of my 5D was mandatory for me. Unfortunately the CLS XL-Clip filter for EOS cameras produce a very slight vignetting at faster optics. It is not really worse an can be corected with a flat, but I found an easy way to bypass that and it is documented here. 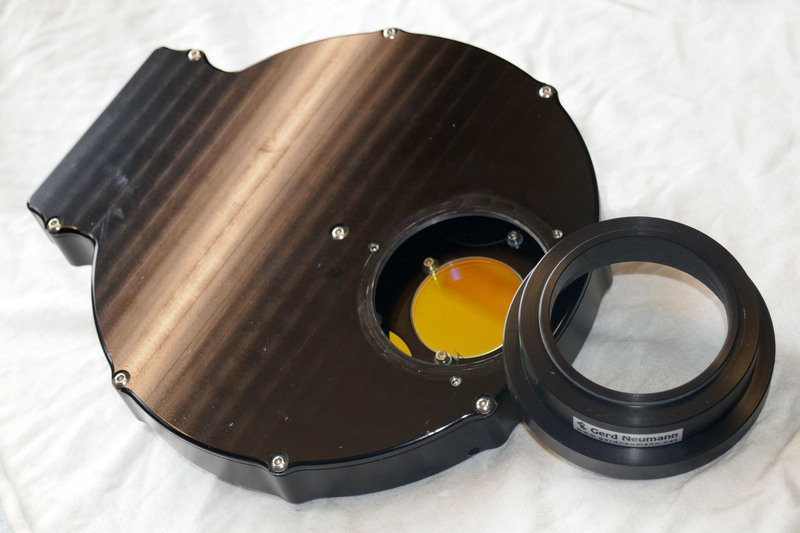 Atik filter wheel EFW-2 with the adapter for the original Skywatcher flattener. My main imaging system is an Atik 383 with filter wheel. It needs 39.5 mm back focus. Since the optimal reducer distance was clear it was easy to design an adapter from the M66x1 of the flattener to the M54x0.75 thread of the filter wheel. The difficulty with the needed adapter is the material-saving design of the filter wheel, which has very small wall thickness and therefore only a low thread depth. The parts for testing the optimal distance I made on my small lathe in my workshop. For the final part I wanted to assure best possible precision and quality, hence I ordered the parts from Gerd Neumann. Find a drawing of the adapter ordered here. The quality of the final adapter is out of any question and in a similar situation I will go to Gerd Neumann again. 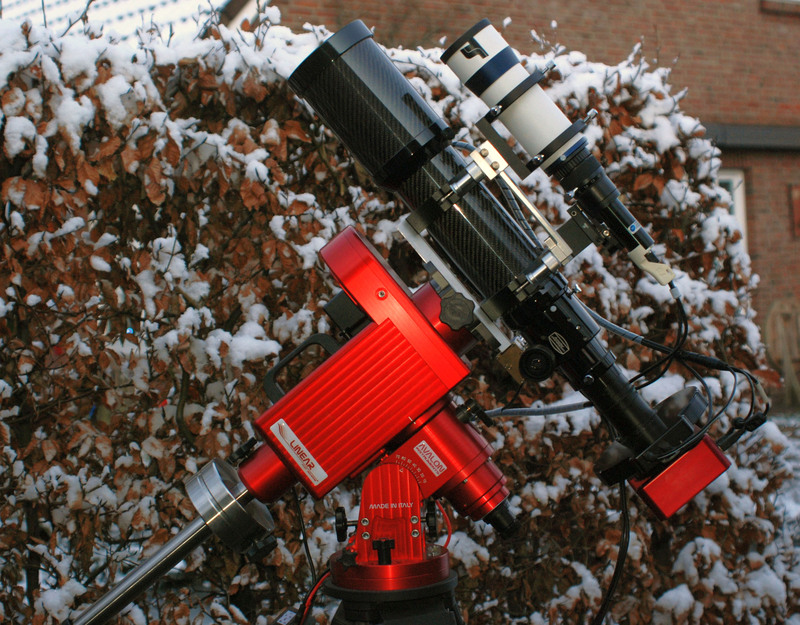 The picture shows the image train of the Esprit with the Riccardi, EFW2 filter wheel and the Atik 383. Here the adapter is not anodized yet. Since I received a some questions regarding this adaptation, I detailed it a bit more in a separate page. You find there a sketch of the adapters, as well. Since one of my personal system requirements is portability, also the handling of the system is a factor. The telescope ready for shooting brings about 10 kg. I can’t hold this by one wrist while clamping it with the other hand. Hence I had to think about a handgrip. The Skywatcher Esprit with its multi-purpose dovetail clamp at the tube rings. At the rear tube ring a small finder shoe for a red dot finder is attached additionally. Another point is the guider set-up. In order to be portable it should be removable as well as attachable reproducible. The aim is to reuse the PHD calibration even though the system was fully disassembled and stowed. Moreover the wiring of the system components should be separable, i.e. without firmly attached cables. 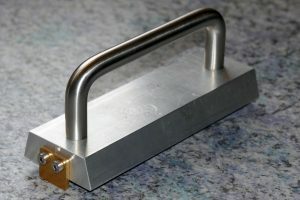 The above given requirements can be fulfilled by a dove tail clamp. As no model with matching size was available commercially, I decided to build my own. The main sets of requirements have been clear soon: The clamping shall be done by one clamping screw; the clamp parts shall be pushed apart by a spring in order to keep the empty clamp always open. Therefore a guiding of the moving part by fitted bolts seemed reasonable. After a few hours in my workshop the clamp shown in the picture arose. A „wannabe“ drawing can be found here. The other picture shows matching hand grip. Basically it is a kitchen hand grip out of the DIY store and a milled dovetail. It is secured against slip out by a brass plate at both sides. I had the situation that after a cold night the clamp was ice coated and even tightly clamped the dovetail slipped out! This is avoided with the brass safeguards. The guiding scope is a standard 60 mm f/4.0 finder combined with a Starlight Xpress Lodestar – in my opinion a very powerful combination. The guider axis is always adjusted parallel to the main scopes axis. Anyway, I had never missed a guide star. Even in the dark vicinity of the Coma Cluster a guide star is available always. All parts of the optical train are threaded in order to avoid shifting effects. I modified the helical in a way that the play is reduced significantly and the position can be locked. The price to pay for is a rotation of the camera, if focused. 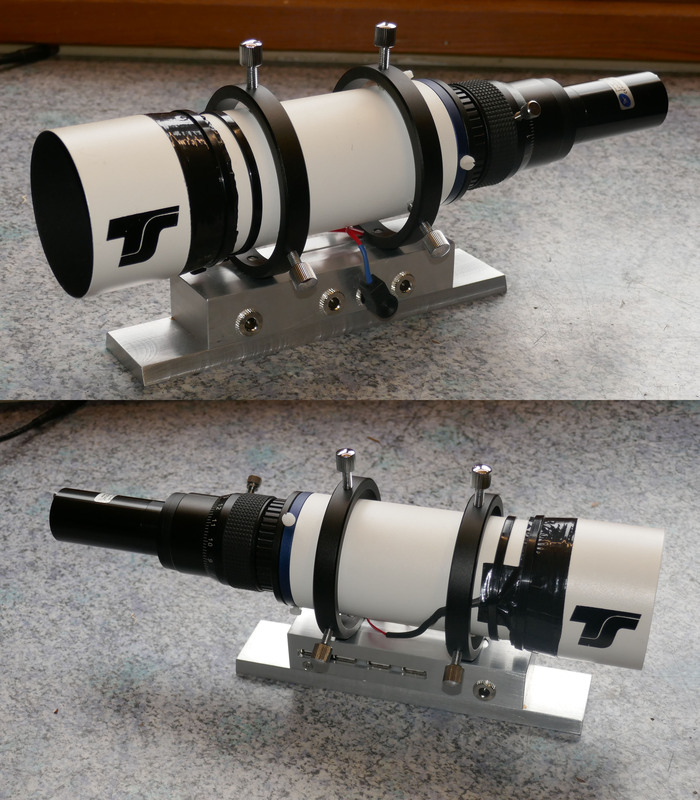 TS 60 mm Finder with heater band, Starlight Xpress Lodestar. Substructure with electronics compartment and dove tail. The only drawback of this system is the short focal length in combination with the comparably large pixels of the Lodestar. In my opinion in case of off-axis guiding or long guiding telescopes the Lodestar is out any question. However, with this set-up one has to be aware that the guide system really has to realize a precision in the order of 0.1 pixels due to the system scale of about 7.0” x 7.2”. My experience is positive, anyway. The heating band is self-made. Is draws about 0.9 W from a 12 V supply. In combination with a neoprene overcoat upon the dew cap the lens never had even a trace of dew. The substructure of the guider comprises a compartment for electronics. Mainly this is a USB 2.0 Hub, a switched DC converter supplying the hub with 5 V and a 12 V power distribution. The lower cap of the compartment is realized as a dovetail. In order to reduce mass the dovetail it is significantly thinner than commercially available ones. Nevertheless the 9 mm thick dovetail gives the needed amount of stability. The electronics give the opportunity to keep the cabling of two cameras, one filter wheel and two heater bands as simple as possible. Find a drawing of the substructure here. I have just bought an ESPRIT ED100 and have too a ASI294. I am not sure how to connect the flattener to the ASI294. I use a IDAS LPS 2″ with M48 . Could you please suggest me something??? Regarding the question I will send you an Email, but don’t expect a solution. I don’t have one ready..
Nice write up! I own a SW Esprit 100ED and I am really interested in using the Riccardi Reducer. Are you still using it with your Esprit? If yes, would you say it is worth the investment? Going back your setup, would you be able to share a sketch of your image train, starting from the focuser of the Esprit 100ED. Like Erza, I am not clear how the Riccardi fit inside the drawtube so and sketch or picture would be very useful. My idea is to have a threaded adapter between the end of the focuser (M74x1) and the Riccardi (Same way how the original field flattener is attached to the focuser). Then, knowing the backfocus requirement of the Riccardi (78.5mm according to your test), I would have to get all the required adapters to attach an OAG, EFW and camera. thanks! I reorganized my pages regarding the Riccardi adaption and added some information as well. I guess that there is now the information you missed. I addition I’ve sent you an Email..
Can you elaborate more on the Riccardi reducer set-up you are using? I am not clear why you have the reducer inside of the draw tube. Also can you share where you had the adaptors made? it very simple, why the Riccardi is inside the draw-tube: If it would be outside, I would have to shorten the tube. Hope that helps? Adaptors I do not machine myself are ordered at Gerd Neumann. Mr. Neumann always does an excellent job. My absolute advice. The Riccardi adaptor came with the telecope. It was acquired by the previous owner. Sorry, but I don’t have any clue where he orderd that thing but is an accurate adaptor, as well. Verwendest du den kleinen oder den grossen Riccardi reducer/flattener in Kombination mit dem Sky-Watcher 100ED? Welchen würdest du empfehlen für eine Canon 80Da? Und für eine Vollformat Canon? ich verwende „den Kleinen“, das ist der mit M63x1 Gewinde. Diesen habe ich auch mit einer EOS 5Da MkII erfolgreich eingesetzt. Das Vollformat wird dabei so gut ausgeleuchtet, dass eine Korrektur mit einem Flat problemlos möglich ist. Die stärksten Abschattungen/vignettierungen in dieser Anordnung kommen dann vom Spiegelkasten der DSLR. Dieses Bild wurde damit angefertigt. Die 80a ist eine tolle Kamera mit APS-C, damit kommt der kleine Riccardi hinsichtlich Ausleuchtung am ED100 locker zurecht. Ich habe dir noch eine Folie per Email gesendet. Thanks for your tips Kai. I would like to know more about your personal adapter. Seems very interesting. I will try also unmount the 2″ glass from the filter and attach it to the M48 ring. Hi Kai. My name is Roberto and I wrote to you from Spain. Recently I had bought an ESPRIT ED100 and it’s my first telescope with this features. I used previusly a little TS65 and a newtonian telescope and all the connections are easy but with the field flattener of the ESPRIT i’m a little confussed. I have a Canon EOS modified and with the TS65 I used an 2″ ir-cut filter screwed to a 2″ to M48 nose. I can’t use this set with the ESPRIT. Some people let me to buy a clip IDAS filter for my EOS but I read in your web that you used a custom rings to screw the filter. Do you recomend me this solution? In a few months I hope to get a CCD camera and I’m in doubt. I have no experience with the IDAS, but I assume the vignetting may be the same issue with all full size CLip-On filters. With the Astronomik it is not unacceptable in principle, but for me it was annoying and I didn’t like it. I can’t give you a recommendation. Even with my CCD I’m glad to have the choice between two cameras. The 5D gives me a large field even with 550mm focus length and the 383 better resolution and narrowband capabilities. Maybe the invest in the SLR image train won’t be wasted money.